Only a tiny fraction of the visually impaired population reads Braille, and that is in part due to the fact that Braille printers can cost anywhere from $1800 to $80,000. Now researchers at J. Walter Thompson (Bangkok) in Thailand have found what could prove to be a cheaper option. They've developed a new type of ink which can be printed from regular inkjet printers on paper to create 3d effects like Braille. Dubbed Touchable Ink, rests on the surface of the paper rather than being absorbed. “This results in an embossed effect that makes the printed areas highly perceptible to the sense of touch. 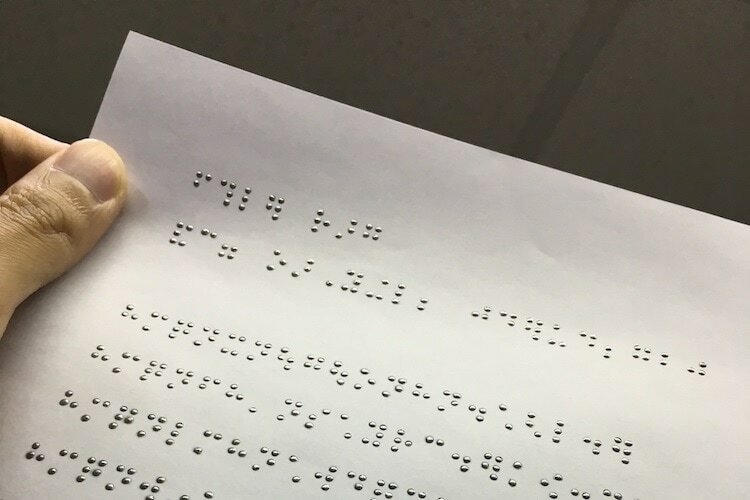 This innovative ink can therefore enable braille printing on normal paper through normal printers to substitute a dedicated braille embosser that is far more expensive,” explained Satit Jantawiwat, chief creative officer at J. Walter Thompson Bangkok. Touchable Ink is still more of a research project than a commercial product, but if it does reach the market it could be used, for example, to print out a map with the key details raised above the surface so that they can be found by touch rather than sight. And if the ink binds well enough to let you deposit multiple layers, this might even offer a new alternative for 3d printing, but it's still too early to say. The ink is currently being test-printed by the Thailand Association of the Blind. There's no mention of a commercial partner which could get it into mass production, but one could step forward if they knew there was a wider market for the ink. It's cool that it can be used to print Braille, but that's a tiny market. In order to get the price down, the manufacturer will have to find other uses for the ink. How would you like to see this ink used? Now that would a great idea! Cute idea, but it would probably still be more economical to have them printed in bulk. As an artist, I see great uses for it. Would make for great “touchable” art prints, greeting cards, business cards, and for making texture plates for clay and metal foil. Can you imagine what Van Gogh’s “Starry Night” would feel like? If I had money, I would invest!